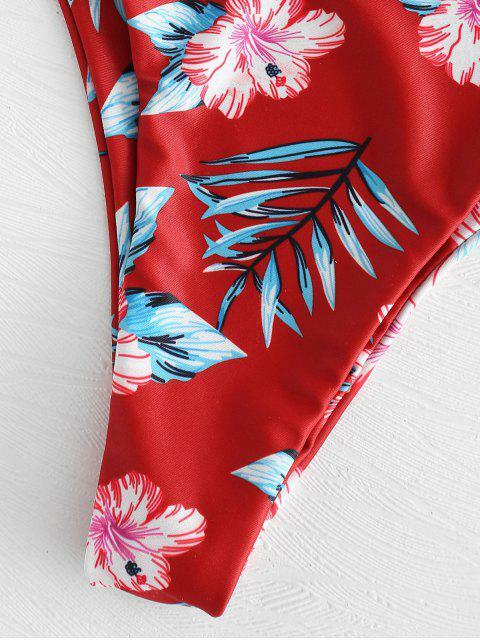 [22% OFF] 2019 Lace-up Floral Leaf Print Bikini Set In CHERRY RED | ZAFUL .. Fits super good and great material! The bottoms fit but are way too cheeky for me but i’m in love with the top! LOVE LOVE LOVE. The shape of the bottoms are perfect and the top strings are long enough to be adjusted if you need it tighter or looser. I had 0 issues with the fit. The only issue I found was a slightly odd stitching in the bottoms, so they do not lay perfectly flat with your hips. It's something only you would notice though. Still a 5 star bathing suit for the price! Transporting you to balmy days with floral and leaf print, the bikini top allows you to customize your fit with self-fastening at the back and removable pads, and the bottoms have a high-cut hip that gives the illusion of a longer, leaner silhouette.